Parrot's attempt at stirring up the stale headphone market is a success. The vibrant style, reliable functionality of both hardware and software and stellar sound performance make up for the steep price. The Parrot Zik 2.0 wants to stir things up in the world of headphones. First, by requiring a smartphone app to unlock its many features and second, by charging a steep $399 (£299, AU$499). Despite these hoops, the Zik 2.0 are an excellent option for tinker-savvy listeners interested in a set of booming headphones with only a few nagging strings attached. 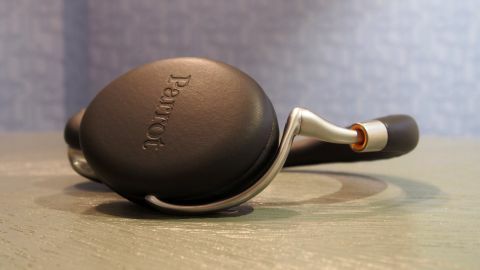 Thanks to designer Philippe Starck at the helm, Parrot has whipped up an attractive set of headphones. The pleather-coated design is appealing, even with the subtle branding stamped on top. Steel sidearms can adjust, but compared to the Bose QuietComfort 25, the Zik 2.0 doesn't dole out much headspace. Only four adjustors jut out from the headband, contributing to just a knuckle's worth of added wiggle room for my head. Cleverly designed rails attach to the sidearms from which the earcups hinge. These extensions hug the curvy profile of the earcups and offer 90 degrees of lateral swivel, making the option to rest the cups on your neck an easy feat. Compared to the original Zik, the earcups are thinner and have a retooled feature layout. Covered front to back in the same material that comprises the headband, they are also generously padded. A touch-sensitive panel takes up the entire surface area of the right cup's outer shell. A small offering of physical features are found around its perimeter: a microUSB port, 3.5mm input for wired listening and a power button. There's a sensor on the right earcup's padding that detects whether the Zik 2.0 are on your head, pausing the music when removed and resuming again once placed back on. Each cup is sprinkled with striking, metal-rimmed accents that house external microphones to boost the effectiveness of the active noise cancellation. Lastly, the outer section of the left earcup pops off to reveal a swappable, rechargeable battery. The Parrot Zik 2.0 doesn't work without an app. Sticking a fork in the standard plug-and-play nature that makes headphones so universal is a bold move that might make users uneasy, but don't worry, it works well here. By putting half of its eggs, so to speak, in the headphones and the other half in a companion app, the Zik 2.0 aims to bring the listener a nice mix of hardware and frequently-updated software to back it. The Zik 2.0 is a tight fit. I've been graced with a large noggin and the headphones feel constricting from the get-go, especially with the limited adjustment allowed. The build materials are comfortable, but for my head in particular, the headband really grinds against me. However, most people should be fine. The touch functionality works as intended and is convenient. Aside from basic listening, it's one of the very few highlighted features that works independently of the app on Android and iOS. The sensor on the right earcup that detects your head is the other. That's a lonely set of features. Thankfully, the free-to-download Parrot Zik 2.0 app available on Android and iOS opens a treasure chest of features. The Zik 2.0 relies tremendously on it and, thankfully for users, it's a good app. Here are some key features. Battery life and status indicators are lit up once a smartphone detects the Zik 2.0. A dial that can be adjusted to let in noise from the outside world with 'Street mode.' Alternatively, crank noise cancellation up to the max to drown it out. My favorite equalizer is 'punchy.' It adds a thick layer of 'oomph' to every genre of music. The sound performance, with or without the app, is the Zik 2.0's biggest selling point. Parrot makes great use of the over-ear design to work in a signature that offers deep bass and balanced mids and highs that doesn't tread on each other, all presented on a massive soundstage. Battery life stands at six hours of wireless play with active noise cancellation activated. I was able to squeeze more out of it using "Street mode". The battery gets a huge boost in "Flight mode" to an advertised 18 hours. This mode initiates active noise cancellation via wired connection and can only be activated through the app. Despite these improvements, the results are paltry compared to the 25 hour performance per charge of the Sennheiser Momentum Wireless. The confident design work on the Zik 2.0 from Philippe Starck elicits double-takes. Sound performance is "Bro, you've got to listen to this" good. It's one of those headphones that I enjoy listening to old, forgotten songs with again. The required app is a solid performer, and setup on both Android and iOS is a cinch. These headphones require prior ownership of a smartphone. That's not a huge leap of faith in 2015, but if you haven't adopted a smart device yet, that's an expensive barrier to entry. Despite the boatload of functionality the app brings, $399 still isn't cheap for headphones. If you own a smartphone, are intrigued by the idea of a set of headphones that sidesteps conventional plug-and-play and have $399 to spare , get the Parrot Zik 2.0. Despite some comfort issues and a weak battery, the Zik 2.0 live up to my standards as high-performance headphones that offer stellar design and tons of functionality.